For most students, the questions “What do you want to do when you grow up?” and “Where do you want to go to college?” are asked completely independent of each other. We teach students to base career goals on their interests and strengths, and to pick colleges based on location, culture, and academic rigor. However, PayScale’s College ROI Report rankings by career path asks students to shift that thinking a little, and encourages them to start thinking of their future career path as an influencer when they pick a college. Our rankings, which show the ROI of alumni from colleges who work in a specific job type, help students and their parents find the best value colleges by career path. This way you can identify where alumni get a college education and launch successful careers in the career path you are interested in. Art Careers (Includes media, sports and entertainment): Art directors, graphic designers, fine arts professions, actors and actresses, fashion designers, industrial designers, audio and video technicians, film and video editors, copywriters, technical writers, etc. Business and Finance Careers: Consultants, budget analysts, buyers and purchasing agents, accountants, auditors, financial analysts, loan counselors and officers, event planners, online merchants, entrepreneurs, etc. Education, Training, and Library Occupations: Elementary school teachers, secondary school teachers, teacher assistants, professors, middle school teachers, etc. Engineering Careers: Mechanical engineers, petroleum engineers, electrical engineers, civil engineers, engineering managers, chemical engineers, aerospace engineers, drafters, environmental engineers, etc. Healthcare Careers: Nurses, nurse aids, lab technicians, acupuncturists, dental hygenists, dieticians and nutritionists, emergency medical technicians and paramedics, midwives, occupational therapists, etc. Legal Occupations: Lawyers, paralegals, legal assistants, legal secretaries, corporate counsels, title clerks, escrow officers, etc. Marketing and Sales Careers: Marketing managers, marketing directors, salespeople, account executives, customer support, PR specialists, social media managers, telemarketers, real estate brokers and agents, etc. Protective Service Occupations: Police officers, security guards, correctional officers, lifeguards, loss prevention agents, detectives, etc. Science Careers: Biochemists, biophysicists, chemists, climate change analysts, economists, city and regional planning aides, foresters, food scientists, geological and petroleum technicians, survey researchers, urban planners, etc. Social Services and Community Occupations: Social workers, medical case managers, mental health counselors, social services case managers, school counselors, pastors, academic advisors, substance abuse counselors, etc. Tech Careers: Software developers, computer scientists, IT professionals, computer network specialists, database administrators, database architects, information security analysts, mathematical technicians, statisticians, web developers, video game designers, software QA testers, etc. In order to see the best college return on investment by career, take a look at the job family that you are interested in and see which schools show high ROIs for that career. This can help narrow your school search to ensure that you attend a school where alumni go on to work in the field you are interested in. It is important to note that PayScale’s College ROI calculations do not include workers who go on to earn a graduate degree, so some job families may see lower ROIs than you expect. For example, we can’t include salaries of doctors and dentists in healthcare jobs since those workers have MD or DO degrees. Our best value colleges by job rankings are meant to help you see high level trends. Looking at factors like graduation rate and the percent of students who go on to get graduate degrees will help influence your decision as well if you are planning to go to graduate school. There are not good majors or bad majors. STEM (science, technology, engineering and math) majors do tend to earn more, but there are plenty of schools with high ROIs for alumni who study the humanities and art. You just have to make a smart investment, and thinking about college in terms of cost and future earning potential is a good step in that direction. 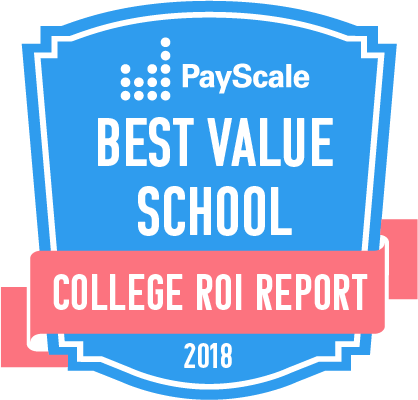 Did your school rank well in one or more of the categories of the 2018 PayScale College ROI Report? You can easily share that good news with the world by placing a College ROI Report badge on your website.